NOTE: I’ve added some additional info on making the card-with-pocket to the original PDF, and incorporated the templates as well. THIS PDF should have everything you need. Well that was a challenge! The template I used for my original cards was on the disc from the book – that is something I am not able to share. 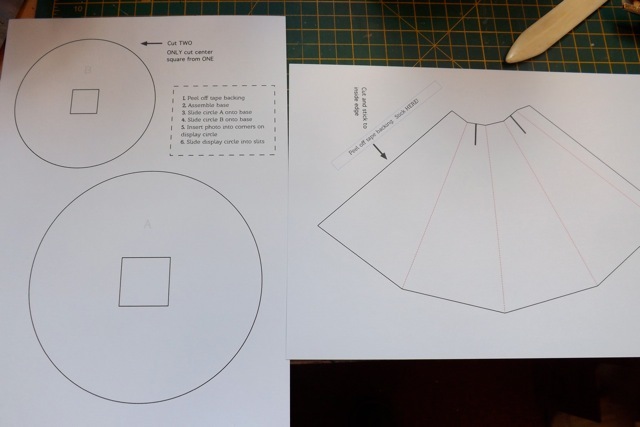 So I had a go at making one myself, using the basic idea as the starting point. 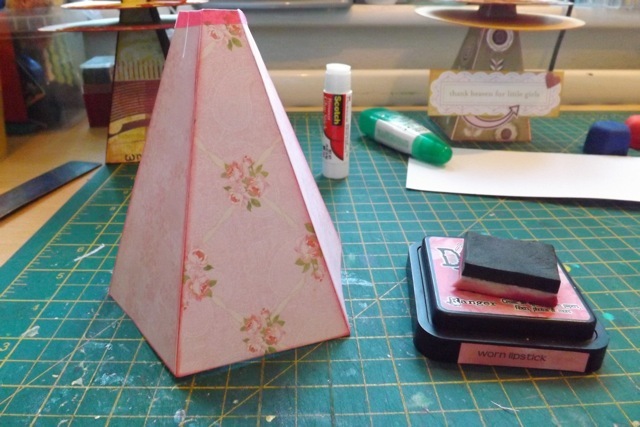 Mine (the pink one below) is smaller, in order to fit it inside a card , and the shelves are farther apart so you can add text and have it a little more readable. I think it works. 1. Download the PDF template here. There are some little bits of text in the PDF as well – if you are hand delivering this, I would say you can omit that and just set it up for them. The plain text bits are for YOU, not to include on the card LOL! 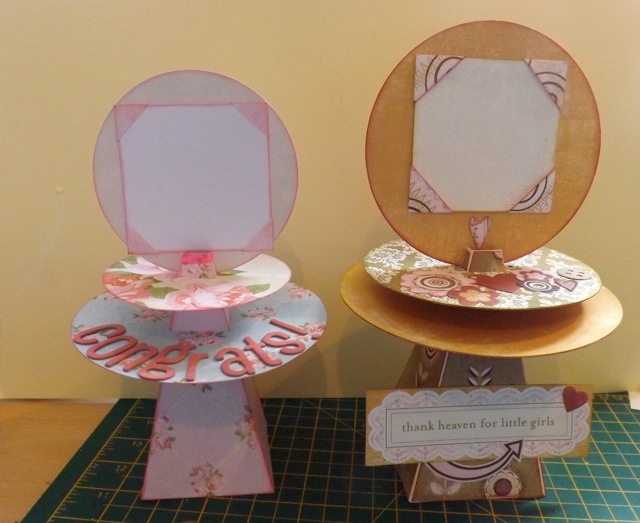 make it a square or rectangle – what about 4 1/4 x 6 1/4 so a standard photo fits on it? 3. 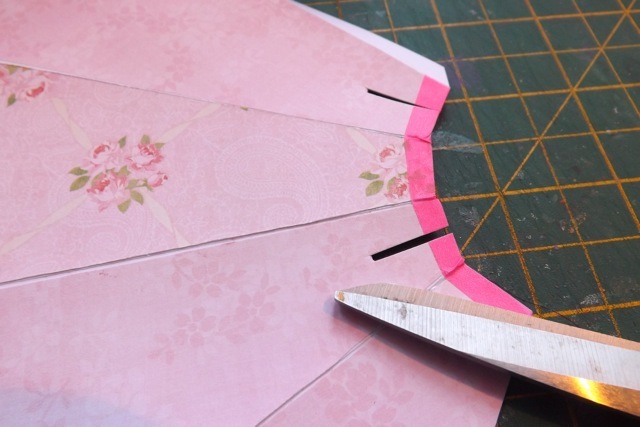 Decorate them as you like – cut a 2nd template to use to cut the patterned paper, stick patterned paper to the back of the template then cut, or decorate just the central panel. I added a little bit of Washi tape along the top edge, before I cut the slits that hold the display. Totally the wrong colour, I’ll probably cover it or remove it (Washi tape is SO forgiving!) but it will make the top more sturdy. I cut to the OUTSIDE of the lines on the template, but maybe just a snip along the line. You want it to hold the display item securely, and it may depend on how thick your cardstock is, how many layers you have, etc. I love my Distress ink, so of course I inked the edges, and you can see I used the focal point paper just on the front panel. 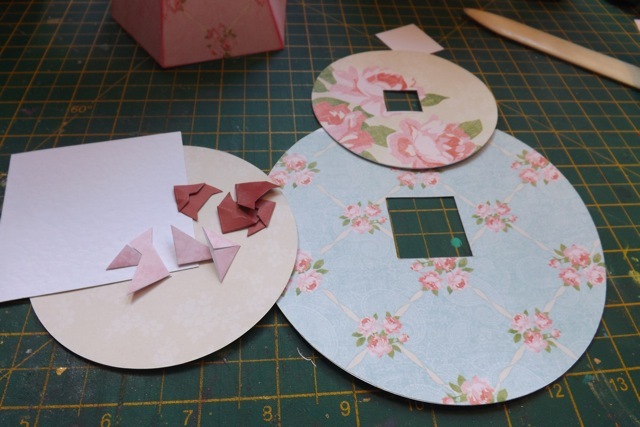 Cut the circles and decorate them on the BACK, leaving the squares visible so you can cut them out after they are decorated. Note: I made my folded photo corners, so they matched the paper, but commercial photo corners work too. I also cut a 3 x 3 inch square as a sort of mat, attaching the photo corners to THAT and then the square to the display circle. 4. 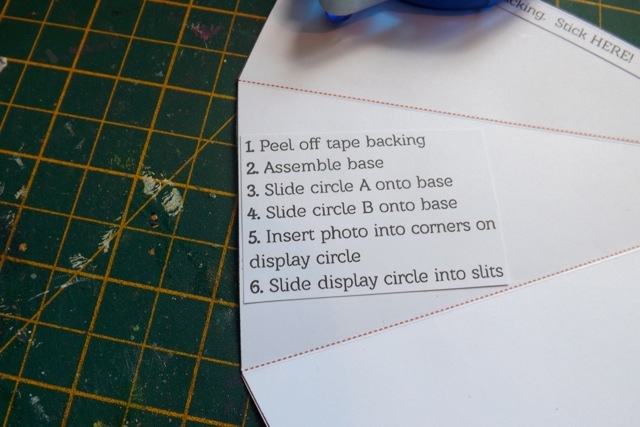 Add double-sided tape to the flap – don’t peel off the backing! That is it for the display – now, you can make another card to house it. 1. 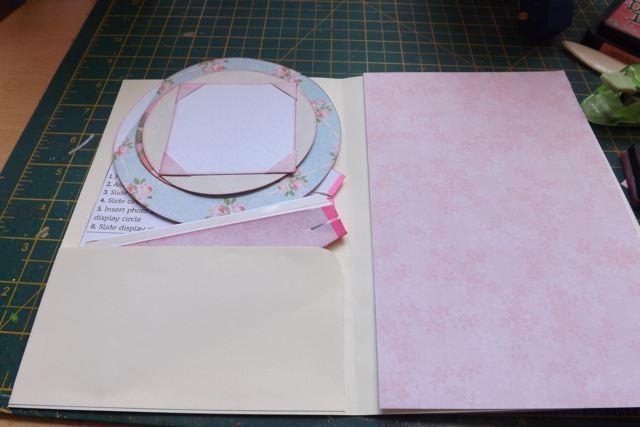 Fold an A4 sheet in half for the card base. An 8.5 x 11 inch sheet should also work. 2. 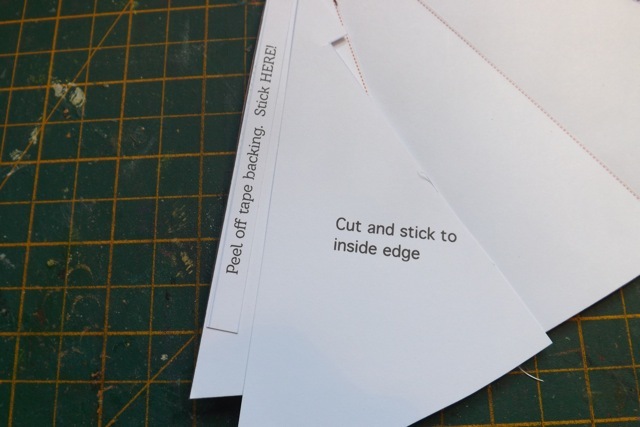 Cut another strip widthwise, from the same size paper. Mine is about 2- 3 inches wide. Round the upper right corner. 3. 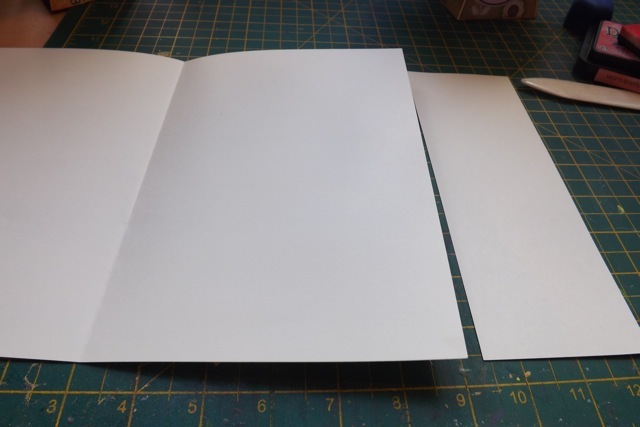 Attach this just along the bottom edge, along the bottom of the inside page, folding it over to the front of the card and attaching the full area to the front of the card. This creates a little pocket for the display stand bits. Decorate the front of the card as you like. Now, I want to test a theory. I THINK if I use the trick to make a blog tutorial a PDF it will make the link to the PDF doe the template clickable. Let’s see if it works…. in any case, here is a link to that in this blog post, but it won’t be in the PDF as I have to make the PDF before placing the link! Note: Well yippy skippy! The PDF of the preview of my blog post worked perfectly, and includes a clickable link to download the template PDF from the instructions PDF. Woo hoo! Have fun with this project, and LMK if you have a brilliant use for it. My feeling is it’s perfect for a new baby, or for a wedding card, as those events seem to naturally include something to display (like a photo) but I also think it would be cute as a birthday card, maybe with a photo of the birthday person as a child for the display part! I may just make one of them now, so I can do a YouTube doodah for it. But I’d be interested in any other thoughts you might have. Categories: cards, downloads, paper sculptures, tutorial, Uncategorized | Tags: cards, how-to, paper sculpture | Permalink.